The Tampa Bay Lightning travel to Scottrade Center to play the St. Louis Blues on Tuesday, October 27, 2015. The opening line for this game has the Lightning at +109 and the Blues at -120. The over/under has been set at 5.5. Tampa Bay comes into this matchup having played 9 games. They have an overall record of 5-2-2 and on the road they have a record of 3-1-2. Currently they are 2nd in the Atlantic Division. They've scored 27 goals and given up 24 goals for a point differential of +3. St. Louis shows up with a record of 5-2-1 including 1-0-1 at home this season. They are 4th in the Central Division. They've scored 23 goals and surrendered 20 for a goal differential of +3. Steven Stamkos has accumulated 7 total points this season for the Lightning. He has 5 goals this season with 21 shots on goal giving him a shooting percentage of 24%. He has a total of 2 assists on the season and averages 19 minutes played per game. Tyler Johnson is averaging 18 minutes of ice time per contest this season. Over that span he has 0 goals by way of 24 shots. He has tallied 5 assists giving him a total of 5 points for the year. Ben Bishop has 5 wins and 2 losses on the year in net for the Lightning. He has given up 21 goals on the 226 shots he has faced. He has 205 saves for a save percentage of 91%. 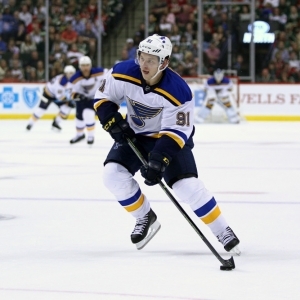 Vladimir Tarasenko has accumulated 9 total points this season for the Blues. He has 5 goals this season with 36 shots on goal giving him a shooting percentage of 14%. He has a total of 4 assists on the season and averages 20 minutes played per game. Alex Steen is averaging 20 minutes of ice time per contest. Over that span he has a shooting percentage of 13% by getting 4 goals by way of 31 shots. He has tallied 4 assists giving him a total of 8 points for the year. Brian Elliott has 4 wins and 0 losses on the year in net for the Blues. He has given up 11 goals on the 119 shots he has faced. He has 108 saves for a save percentage of 91%. The Lightning have 12 total points this season. They have scored 27 goals while giving up 24 goals. They have had 27 power play opportunities and have scored 5 goals on those chances for a percentage of 19%. The Lightning have allowed 25 power play opportunities and given up 7 goals on those chances for a penalty kill percentage of 72%. They average 27 shots per game and as a team are shooting 11.11% for the season to this point. They allow 29 shots to their opposition per contest and have a team save percentage of 91%. The Blues have a total of 11 points on the season. They have 4 power play goals on 29 opportunities thus far for a percentage of 14%. They have allowed 32 power play opportunities and have given up 6 goals on those chances for a penalty kill percentage of 81%. As a team, the Lightning have a total of 23 goals scored while they've given up 20 goals to this point. They average 34 shots per contest and have a team shooting percentage of 8.49%. As a team they give up 26 shots per game and have a save percentage of 90%.